The Faculty of Medicine is delighted to report the outcome of the sixth Imperial Confidence in Concept (ICiC) competition, which was instigated to support the College-wide development of novel devices, diagnostics and therapeutics for areas of unmet clinical need. This year, a fund in excess of £1.6M was made available from the MRC (Confidence in Concept fund), NIHR Imperial BRC, Wellcome Trust Institutional Strategic Support Fund, EPSRC Impact Acceleration Accounts, and HEIF funding, as well as support from NIHR BRC at The Royal Marsden and The Institute of Cancer Research. For the second year in a row we have also partnered with AstraZeneca to offer the AZ Innovation Fund as part of the ICiC call. The aim of the AZ Innovation Fund is to enable drug discovery by facilitating the development of new technologies and the exploration of disease biology. Why is the ICiC important? The aim of the scheme is to strengthen the College’s early translational research portfolio, providing funding to help with the translation of novel therapeutics, devices and diagnostics towards clinical testing and/or a marketable product. This is achieved by providing vital pilot-funding to bridge potential gaps between discovery research and applications for MRC Developmental Pathway Funding Scheme or Developmental Clinical Studies Funding Scheme. Since its inception in 2012, 117 projects have been funded, leveraging in excess of £61M in follow on funding, transforming the pull-through of discovery science to clinical application across the College. The cross-College panel, which was chaired by Professor Roberto Solari and included external members, was very impressed with the high quality of applications this year. Self-Homing Intelligent Needle Ecosystem (SHINE) (Ferdinando Rodriguez y Baena). The Faculty is delighted to report the outcome of the fourth Imperial Confidence in Concept (ICiC) competition to support the College-wide development of novel devices, diagnostics and therapeutics for areas of unmet clinical need. A fund in excess of £1.6million was made available from the MRC (Confidence in Concept fund), NIHR Imperial BRC, Wellcome Trust Institutional Strategic Support Fund, EPSRC and BBSRC Impact Acceleration Accounts, as well as support from NIHR BRC at The Royal Marsden and The Institute of Cancer Research. The ICiC scheme provides vital pilot funding to bridge the potential gap between discovery research and well-developed applications for MRC Developmental Pathway Funding Scheme / Developmental Clinical Studies Funding Scheme support. The Panel, including external members and chaired by Professor Roberto Solari, was delighted with the high quality and wide range of applications. Examples of the breadth of funded proposals include: ‘Preclinical assessment of a lead NMT inhibitor as a novel anticancer agent’ (Tate); ‘Development and validation of a 2 gene RNA test to detect bacterial infection’ (Levin); ‘A ‘smart’ ultrasonic focus for brain drug delivery’ (Choi); ‘GM-CSF gene therapy for pulmonary alveolar proteinosis’ (Griesenbach). We are also pleased to announce two co-funded projects with our colleagues at the NIHR BRC at The Royal Marsden and ICR; ‘The development of a high-throughput breathomics platform for oeosophago-gastric cancer’ (Hanna) and ‘The use of innovative spectroscopy technologies (i-Knife and DESI) for the improvement of the management of women with abnormalities in cervical screening’ (Kyrgiou). The first project is a collaboration between Prof George Hanna (ICL), Dr Andrea Romano (ICL), Prof David Cunningham (ICR), Mr Asif Chaudry (ICR), and Prof Paris Tekkis (ICR). The second project led by Dr Maria Kyrgiou involves collaboration with the Royal Marsden gynaecological oncology team (Mr Butler, Mr Ind, Mr Barton). We are looking to support outstanding early-career clinical professionals wishing to undertake research, at least in part overseas, to improve the health of people and reduce health inequalities in developed and developing countries. Through the provision of clinical training fellowships in global health, we aim to provide opportunities for the most promising clinical academics, at the very beginning of their careers, to develop bids for independent fellowship funding. We anticipate that each fellow will be supported by two mentors, one based at an Imperial Campus, and one based overseas. All fellowships must commence by 1 September, 2016. Please refer to the Wellcome Trust Institutional Strategic Support Fund webpage for application forms and guidelines. If you have an Imperial and overseas sponsor, please contact ISSF@imperial.ac.uk for an application form and further information. Should you be an interested applicant looking for a sponsor, please provide a max 500 word summary of your interests, brief summary of project and research experience to ISSF@imperial.ac.uk by 25 January 2016. We cannot guarantee that all interested applicants will be matched with an overseas sponsor. Full applications would need to be submitted by 4 March 2016 to ISSF@imperial.ac.uk. Interviews for shortlisted candidates are expected to take place the week commencing 2 May 2016. This Fellowship program is funded through the Global Health Stream of the Wellcome Trust Institutional Strategic Support Fund, and lead by the Imperial Wellcome Trust Global Health Research Centre in conjunction with the Institute for Global Health Innovation. Committed to equality and valuing diversity. We are also an Athena SWAN Silver Award winner, a Stonewall Diversity Champion, a two Ticks Employer and are working in partnership with GIRES to promote respect for trans people. The Faculty is delighted to report the outcome of the third Imperial Confidence in Concept (ICiC) competition to support the College-wide development of novel devices, diagnostics and therapeutics for areas of unmet clinical need. A fund in excess of £1.3million was made available from the MRC (Confidence in Concept fund), NIHR Imperial BRC, Imperial Innovations, Wellcome Trust Institutional Strategic Support Fund, EPSRC Impact Acceleration Account and as well as support from NIHR BRC at The Royal Marsden and The Institute of Cancer Research and Chelsea & Westminster Hospital NHS Foundation Trust. This is the first year that Chelsea & Westminster Hospital NHS Foundation Trust has taken part in the scheme. The ICiC scheme provides vital pilot funding to bridge the potential gap between discovery research and well-developed applications for MRC Developmental Pathway Funding Scheme / Developmental Clinical Studies Funding Scheme support. The Panel, including external members and chaired by Professor Roberto Solari, was delighted with the high quality and wide range of applications. 22 Awards were made. We are seeking to support novel biomedical research collaborations across disciplines and departments. Proposals for pilot or feasibility work for high risk projects, to support collaborative cohesion, to test or develop new methods, or proof of concept studies are encouraged through this call. It is envisaged that the outcomes of supported work will then form the basis of a major grant application. Whilst funding is available to support any research within the remit of the Wellcome Trust, networks undertaking interdisciplinary research in the themes of Biomedical Engineering, Global Health and Development (including Epidemiology, Prevention and Control) and Infection Research (including Antimicrobial Strategies and Resistance) are particularly encouraged. The Faculty is delighted to report the outcome of the third annual Networks of Excellence competition to foster collaborative biomedical research endeavours across the Faculties of Medicine, Engineering, Natural Sciences and the Business School. The scheme is supported by the Wellcome Trust Institutional Strategic Support Fund (ISSF) and comprises matched funding from the College; a total fund in excess of £900K was made available to support novel, interdisciplinary biomedical research. The Networks of Excellence scheme provided funding to support: pilot or feasibility work for high risk projects,collaborative cohesion, testing or development of new methods,or proof of concept studies. Funding was available for all research within the Wellcome Trust remit; proposals addressing interdisciplinary research in infectious diseases, medical imaging, and diabetes/metabolic medicine were particularly encouraged. Applications were assessed by the Cross-College ISSF working group, chaired by Professor Simon Taylor-Robinson, and shortlisted applications considered for funding by the Vice Provost (Research) with the Cross-College Research Proposal Review Group. The Chair was delighted with the high quality of the 46 interdisciplinary applications received. Examples of the breadth of funded proposals include: ‘Visualising bacterial infection in adult zebrafish with novel infrared protein fluorophores’ (Ulijasz), ‘Reducing health impacts from excess sodium intake in coastal SE Asia using novel water treatment technologies’ (Butler), ‘Targeted nanoparticles for preclinical diagnostic imaging of Parkinson’s disease’ (Dunlop), ‘Using Functionalised Nanorods in Theranostics’ (Wilton-Ely). The Faculty is delighted to report the outcome of the second Imperial Confidence in Concept (ICiC) competition to support the College-wide development of novel devices, diagnostics and therapeutics for areas of unmet clinical need. A fund in excess of £1.2million was made available from the MRC (Confidence in Concept fund), NIHR Imperial BRC, Imperial Innovations, Wellcome Trust Institutional Strategic Support Fund and as well as support from NIHR BRC at The Royal Marsden and The Institute of Cancer Research. The ICiC scheme provides vital pilot funding to bridge the potential gap between discovery research and well-developed applications for MRC Developmental Pathway Funding Scheme / Developmental Clinical Studies Funding Scheme support. The Panel, including external members and chaired by Professor Roberto Solari (NHLI), was delighted with the high quality and wide range of applications. Examples of the breadth of funded proposals include: ‘A wearable sensor for fetal movement’ (Nowlan), ‘Towards a compact proton irradiator for in vitro radiobiological studies’ (Posocco), ‘Donor TCRVa24 iNKT cells in the prevention pf acute-graft-versus-host disease in allogeneic haemopoietic stem cell transplantation’ (Karadimitris), ‘Intranasal diagnostics in food allergy: a feasibility study (INDY project)’ (Turner) and ‘The development of highly specific SIRT2 inhibitors as a novel treatment for Parkinson’s disease’ (Fuchter). We are also pleased to announce two co-funded projects with our colleagues at the NIHR BRC at The Royal Marsden and ICR from Drs Ed Tate (ICL) and Bissan Al-Lazikani (ICR) and Professors Bob Brown (ICL) and David Cunningham (ICR). We are seeking to support novel biomedical research collaborations across disciplines and departments. Proposals for pilot or feasibility work for high risk projects, to support collaborative cohesion, test or develop new methods, or proof of concept studies are encouraged, rather than standard projects. It is envisaged that the outcomes of supported work will form the basis of a major grant application. Whilst funding is available to support any research within the remit of the Wellcome Trust, networks undertaking interdisciplinary research in the themes of infectious disease, medical imaging and diabetes/metabolic medicine are particularly welcome. The second call of the Imperial Confidence in Concept (ICiC) was launched in January 2014. Building on the success of the 2013 ICiC scheme and NIHR Imperial Biomedical Research Centre (BRC) / Imperial Innovations Therapeutic Primer Fund, the College has received further funding from the Medical Research Council (MRC), as well as additional support from NIHR Biomedical Research Centre at The Royal Marsden and The Institute of Cancer Research, to continue this scheme. 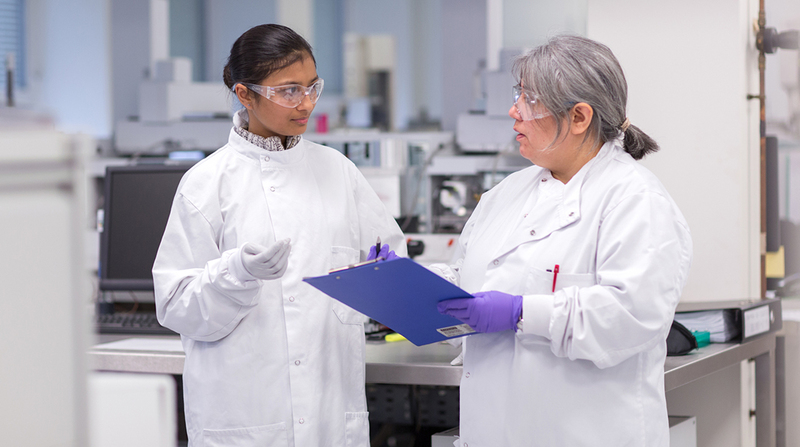 The ICiC scheme provides pilot funding to bridge the potential gap between discovery research and well-developed applications for MRC Biomedical Catalyst: Developmental Pathway Funding Scheme support. 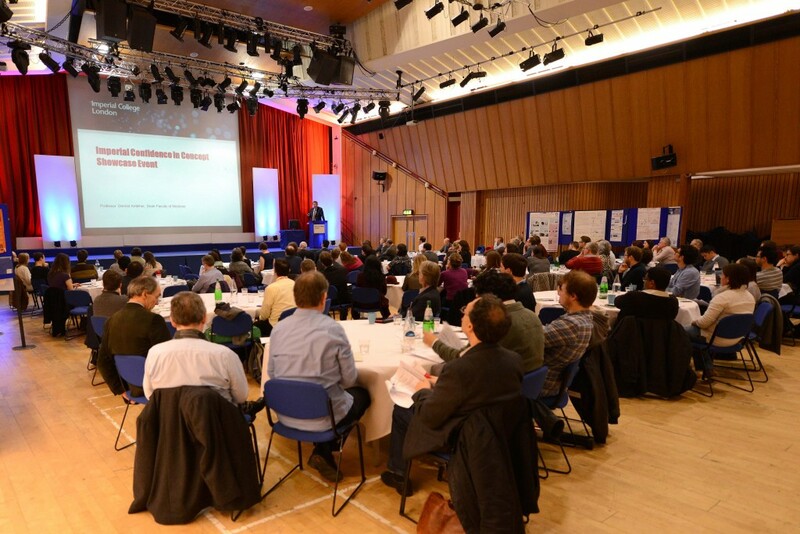 The annual ICiC event was held on Monday 17th February in The Great Hall on South Kensington Campus. This year’s event was focussed on devices and diagnostics and was a great success, attended by approximately 100 academics across the College. Attendees included recipients of awards from last year’s scheme and early career researchers who showcased their ICiC-funded work. This cross-College event had a wide range of speakers including representatives from the Faculties of Engineering (Prof Andrew Amis), Medicine (Prof George Hanna), and Natural Sciences (Profs Tony Cass and Paul French) as well as our collaborators at the NIHR Biomedical Research Centre at The Royal Marsden and The Institute of Cancer Research (Prof Stan Kaye, Drs Nicola Valeri and Gert Attard). The talks were engaging, informative and stimulating and special thanks goes to our external speakers Dr Helen Lee (University of Cambridge) and Dr Ray Bacon (CEO, TRIG1) for sharing their experiences of device and diagnostic development for commercial use with their talks entitled ‘Challenges in developing diagnostics for resource-limited settings’ (Lee) and ‘Commercial…is not a dirty word’ (Bacon). The deadline for applications was 5th March with shortlisting due to take place at the end of March and final funding decisions to be made in May. We are seeking to support novel, interdisciplinary biomedical research collaborations in the themes of infectious disease, medical imaging and diabetes/metabolic medicine. This is a cross-College scheme that welcomes any proposal to offer greater collaboration across disciplines and across departments. Proposals for pilot or feasibility work for high risk projects, to support collaborative cohesion, test or develop new methods, or proof of concept studies are encouraged, rather than standard projects. It is envisaged that the outcomes of supported work will form the basis of a major grant application. Whilst funding is available to support any research within the remit of the Wellcome Trust, networks undertaking interdisciplinary research inin the themes of infectious disease, medical imaging and diabetes/metabolic medicine are particularly welcome. It is envisaged that the outcomes of this work will form the basis of a major grant application. This scheme will be launched the week beginning 17th March 2014 with a deadline of 9th May 2014.